Her career has seen triumph after triumph. Among her most recent successes: being nominated for a 2018 Canadian Folk Music Award for Producer of the Year with her co-producer, Mark Lalama. Suzie achieved finalist status in the Solo/Duo Category at the 2013 International Blues Challenge in Memphis, TN; received the 2012 CBC Saturday Night Blues Great Canadian Blues Award and the 2012 Sirius XM Canada Blues Artist of the Year. 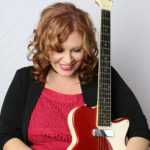 Suzie has won 10 Maple Blues Awards, 1 Canadian Folk Music Award for Contemporary Vocalist of the Year and is a 3X Juno Nominee. Suzie has just released her latest album, a full band roots and blues extravaganza entitled Shake The Love Around.